The global diabetes market supported 10 blockbuster drug franchises in 2014, which generated combined sales of $28.6 billion. Sanofi's basal insulin Lantus ($8.4 billion) accounted for around 30 percent of this figure, showcasing the severity of recent impact on the French company stemming from increased pricing pressure in the US market segment. 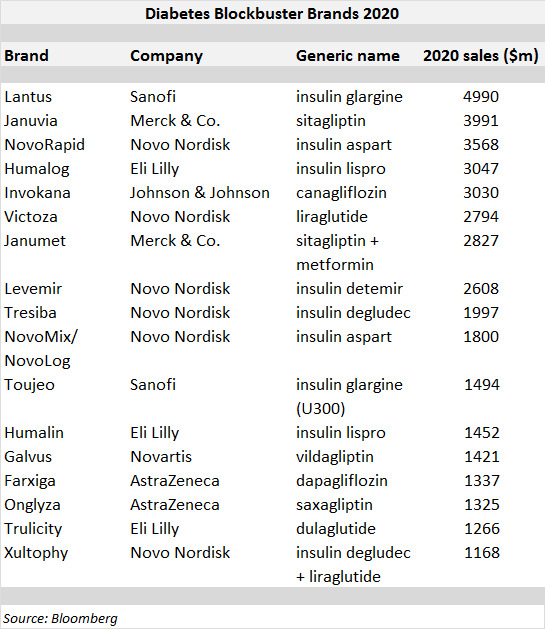 Competing basal insulin Levemir, manufactured by Novo Nordisk, is the fifth largest diabetes franchise with sales of $2.3 billion in 2014. Shorter-acting and mealtime-specific franchises dictate that insulins dominate the list of current diabetes blockbusters, with these segments of the market the preserve of Novo Nordisk and Eli Lilly. The biggest selling oral diabetes drug franchise remains Merck & Co.'s DPP-4 inhibitor Januvia ($3.9 billion), with franchise revenues rounded up to $6 billion when the metformin combination Janumet is included. 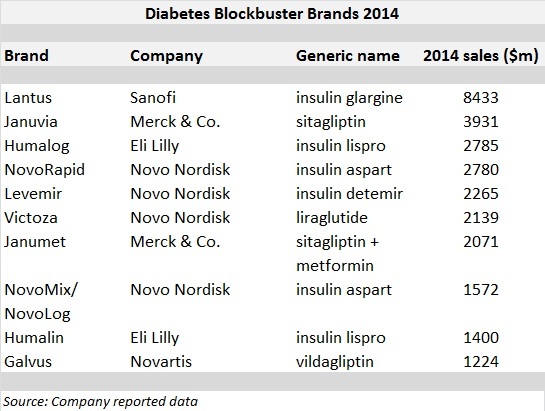 The other non-insulin 'mega-brand' is Novo Nordisk's GLP-1 agonist Victoza, which generated sales of $2.1 billion. By 2020, the number of blockbuster diabetes franchises is expected to swell to 17, according to consensus revenue estimates, with these products forecast to generate combined sales of around $40 billion. Underscored by a handful of recent launches, the number of oral blockbusters will increase by the end of the decade, led by Johnson & Johnson's first-in-class SGLT-2 inhibitor Invokana. The product, which has experienced a faster than rapid ascent since launching in 2013, is forecast to generate 2020 sales of around $3 billion. AstraZeneca's Farxiga will support broader expansion of the SGLT-2 class with anticipated 2020 sales of $1.3 billion. Victoza will edge towards the $3 billion mark by 2020 according to consensus projections but is expected to lose some market share to Eli Lilly's GLP-1 agonist Trulicity, which is flagged to reach blockbuster status by the end of the decade. Lantus is expected to remain the biggest selling diabetes franchise overall but sales will decline to around $5 billion, partly due to rebating pressure and increased competition (indeed consensus forecasts have dropped notably over the past week). Uptake of an improved version, recently approved Toujeo, is modelled to offset some of this decline with sales of $1.5 billion by 2020. However, Novo Nordisk is expected to gain market share from Sanofi in the basal insulin market via the launch of Tresiba, which should gain FDA approval towards the end of this year (it is already approved in numerous ex-US markets). Tresiba is currently forecast to be a $2 billion franchise by 2020, due to perceived superiority versus Toujeo among many analysts, with Levemir also expected to experience steady revenue growth. FirstWord Lists – Diabetes launches to continue unabated: what is in the late-stage pipeline?